Last week, I gave you a real-life example of how some of our Michigan State University Extension colleagues have successfully marketed their curriculum resulting in at least moderate increases in sales of the product in the MSU Extension Bookstore. Today, I’d like to offer another example. 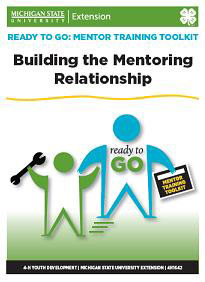 Ready to Go: Mentor Training Toolkit (4H1642PDF) assists youth mentoring programs in the training of new and existing mentors and other youth-serving organizations in training volunteers working with young people. Nearly 88 percent of sales of the curriculum came from outside Michigan. MSU Extension 4-H senior mentoring specialist Lisa Bottomley, the project’s director, attributes national interest to the multiple presentations presented by MSU Extension staff members at national conferences. These included the National Association of Extension 4-H Agents conference in Orlando, Fla., the National Mentoring Summit in Washington, D.C., the National Extension Conference on Volunteerism in Frankenmuth, Mich., and the Galaxy IV Conference in Pittsburgh, Pa. In addition, staff members did a workshop at the 4-H National Mentoring Program grantee training. This year, Lisa will present a workshop and promote curriculum at a table at the training in January. Two out of the five hours she spends training will be on the curriculum. She and associate program leader Molly Frendo will also present two sessions on the curriculum at the National Mentoring Summit again this January. Lisa found that articles she wrote for the MSU Extension website has drawn in interested customers. Articles such as “Why Boundary Setting Matters in Mentor-mentee Relationships,” contain Lisa’s contact information, encouraging readers to contact her for additional information or mentor training materials. Next week, I’ll tell you about another curriculum and how two of our colleagues marketed it.